What it does: Encourages fertile soil and healthy plants. Enables high and reliable yields in small areas. Relieves small growers and gardeners from dependence on expensive fertilizers, toxic pesticides. Teaming with Microbes Approved. What is it: Galil Soil Farm's Terra Pretta with Biochar helps soils retain nutrients and water. Plants and vegetables have a greater chance for strong growth that produces nutrient rich food. If used agriculturally, or on lawns, it can prevent nutrient runoff into rivers and streams. Terra Pretta contains biochar which binds nitrogen so emissions of nitrous oxide (a potent greenhouse gas) are also reduced. Turning waste biomass into terra pretta and biochar also reduces methane (another potent greenhouse gas) generated by the natural decomposition of the waste. Between 20% to 40% of the carbon in the original biomass is locked up in the soil for thousands of years, helping to slow down climate change. Use terra pretta with biochar in the root zone of your plants. Apply in a ratio of 5%-10%. Mix well with soil to avoid losses from wind and water erosion. It may take two growing seasons to fully realize the beneficial effects of terra pretta with biochar. Speed up the effects of biochar by mixing it with urine, manure tea, mycorrhizae, or compost before use. We strongly recommend that you have your soil tested. If your soil is deficient in nutrients, terra pretta with biochar will not make up for these deficiencies. For best results, you should amend your soil with the appropriate nutrients as determined by your soil test. Biochar is a special charcoal made by heating biomass in the absence of oxygen. Our biochar is made in Israel from pinechips. The excess energy is captured for electricity production. We have been trying different terra pretta and biochar mixes in many applications from kitchen composting to garden trials. Our Terra Pretta with BioChar is formed by slow burning pine branches under conditions of oxygen deprivation. 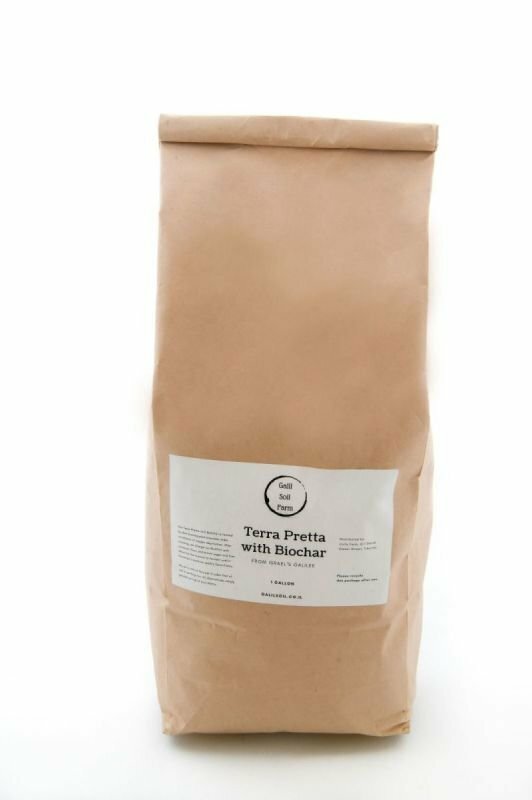 After crushing, we charge our BioChar with compost, flour, and brown sugar and then allow for the mixture to ferment until it becomes a premium quality Terra Pretta. Mix at a rate of 16oz per 4 cubic feet of soil or potting mix. Or alternatively, simply sprinkle on top of your plants.